Rachel Glaser knows the fine art of turning crafts and vintage furniture into a multibillion dollar operation. She oversees financial operations for Etsy (ETSY), an online marketplace for handmade and quirky items. Before becoming Etsy's CFO, she spent three decades building her skills at major corporations, including Disney (DIS) and Yahoo (AABA). For Glaser, running a profitable business is about more than just balancing budgets. Her global team is tasked with helping Etsy innovate and stay competitive, especially as retail behemoths like Amazon start closing in. 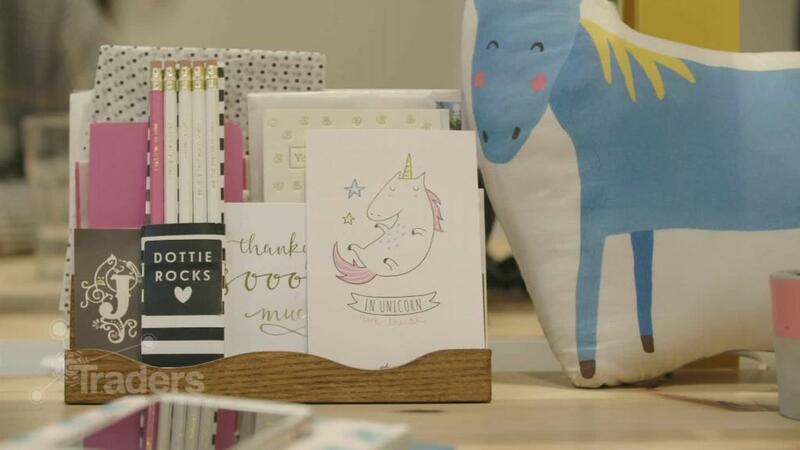 In October, Amazon announced it was expanding its Handmade section to include an online gift shop that would compete directly with Etsy's offerings. Despite industry challenges, Etsy churned out a nearly $82 million profit last year. The company is currently valued at around $3.6 billion. CNNMoney asked Glaser what it takes to lead a winning team, and what she wishes she'd known at the start of her career. Rachel Glaser oversees Etsy's global financial operations. It's important to be comfortable knowing -- and admitting -- what you don't know, while still maintaining the confidence to make decisions. I recognize that there is a lot I don't know, which is why I very much believe in hiring talented people and respecting their expertise. Collaboration is an important part of any job. If you try to do it all yourself, you'll have a really hard time finding success in the business world. Instead, work to build a strong team and leverage your people. My credo is that people are the most important part of what we're doing. While it's important to be aware of your environment, focusing too much on your competitors is a surefire way to finish second. It's essential to think independently and creatively, and not focus on what everyone else is doing. The key to innovation is knowing what resonates with your customers and leaning into those elements. At Etsy, we're the destination for special products -- people come to us when they're looking for items they can't find anywhere else. Others can try to be like us, but we have created a unique brand identity and community around the Etsy platform. What advice would you give someone with your job (or who wants to be in your job)? It's not about falling down, it's about how you pick yourself up. If you never stumble, you'll never have the chance to innovate. Also, surround yourself with a strong team with diversity of thoughts, backgrounds and opinions. Having opposing perspectives is an important part of fueling innovation and creativity. I was so ambitious early on in my career, which isn't a bad thing, but I was always concerned about where the next promotion would come from. Looking back, I'd tell my younger self the same thing I tell my team today: Play the long game. Try to understand where you want to ultimately go with your career and don't be afraid to share that vision with your superiors so that they can help you to make the right connections and get exposure in the right areas. 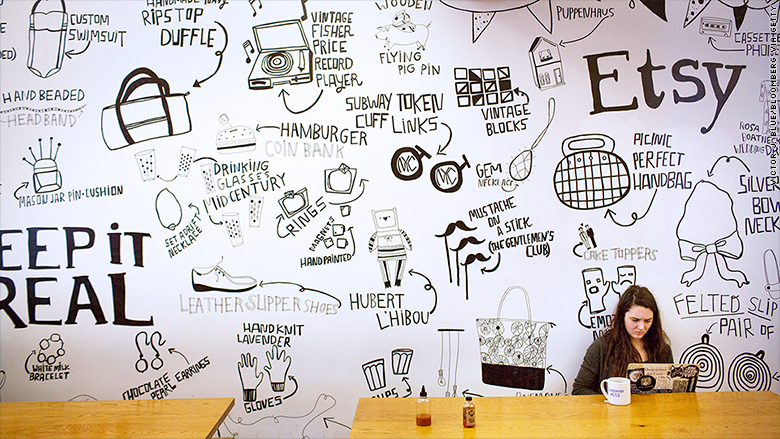 An employee works while sitting under a mural at Etsy's headquarters in Brooklyn, New York. Also, be patient. It takes 6 to 12 months to come up the learning curve at a new job. After that, you should strive to master your role. Promotions will then come naturally because people will keep betting on you. My parents are my strongest mentors and teachers. My mom worked all her life as a psychotherapist and passed a strong work ethic on to me. Her parents were Russian immigrants, and her mother -- my grandmother -- was a social worker during a time when women didn't often work. Even though my mom had a career, she always spent time with her family. She inspired me to find that balance in my own life. My father was a clinical psychologist, so the other influence they had on my life was to encourage open communication and dialogue. As a result, I am naturally inclined to build relationships and connections with my team and business associates.